This was written months ago. If you are Mongolian without influence from the west your diet consists mostly of meat, milk and dried and fermented dairy products, wheat noodles/dough, water, tea and salt. The meat and dairy come from a variety of domestic cattle: cow, sheep, goat, horse, yak, camel, reindeer. aarts: a fermented ricotta-cheese type product. We ate it cooked with rice and milk and sugar. Different but nice. Has a tangy tsate. hua jiao – a coriander-sized dried citrus fruit with a single black seed that smells spice/fruity/peppery which when sucked +/or chewed gives off a substance which makes lips, tongue and mouth tingle progressively more and more the longer in contact. Alarmingly so! Think electric fence. Started out as a pleasant fruity taste. Often used in conjunction with the very hot red pepper sauce. Suppers: Lahgman Manti–bean noodles, ground meat and onions with a two toppings a) raw garlic ground with salt mixed with yoghurt and b) very hot red ground dried red peppers mixed with oil. I forwent the second. Narun: a Kazakh dish: boiled cut up horse with onions, carrots, potatoes, and noodles in the broth. Kirsty taught me to make Mongolian noodles. Rounds of dough (flour and water) rolled very thin, lightly oiled, rolled up and steamed. Then unrolled and cut or broken in pieces. -huushuur and pineapple Fanta. Huushuur is a circle of dough 6-7″ around lightly filled with cooked ground meat and onion, folded over, sealed and deep-fat fried. Very nice. Ate these with college students before going to visit the children in the holding facility. -Mantibuuz: steamed dumplings: 4-5″ circles of yeast dough filled with ground raw cow head meat, onions. Hannahd and Ganbaat made these. They were very filling and delicious. There is also buuz, made with a plain dough which i did not have. -tea with small thick round sweetened biscuits flavored with orange oil, some dusted with confectionary sugar. -Russian ice cream bar, Mongolian ice cream bars. The Mongolian chocolate ones are especially nice. “It is the best performing currency against the US dollar in the world in 2010. The Mongolian currency has bested all others so far, rising 16.7% against the dollar. why? It is an exotic manifestation of a simple trend: currencies of countries with strong exports to China have soared. Mongolia is rich in copper, gold, coal, iron and other mineral deposits. At least two-thirds of its exports go to feed neighboring China’s industrial machine” Wall Street journal Sat/Sun Dec 4-5, 2010, p B18. Found by Jay this evening in the paper. 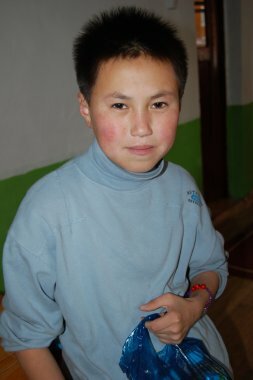 A group of college students from MIU every other Saturday visit a holding center for children picked up on Ulaanbaatar streets. The facility is run by the Metropolitan police and funded by World Vision. It is clean and neat. The children are not. Theoretically the children are between the ages of 7-13. But the 25-30 children I saw were as young as 5 and as old as 15 by my reckoning. The police and WV staff look for the parents and return the children to them. Many parents are drunks and send the children back out onto the streets. So there is a revolving door kind of coming and going happening. If the parents are not found within a set time period, the child is sent to another facility, a longer term one which is more like prison in all ways. It is difficult to establish any relationships with the children because they are only there for a few weeks. Some of the children were developmentally delayed (FAS?) or damaged–some with scars, or tattoos, nails through ears. The older boys were surrepticiously passing cigarettes and playing cards. There was a lot of bravado toughness. They have to be petty thieves to survive on the street. The older and stronger lorded it over the younger: pinching, hitting, taking, making them submit–even in our presence. All of them had been given prior to our coming bags with candy, apples, soda. It is a Buddhist custom after a funeral, a belief that making children happy, or giving joy to them, helps the deceased. The college students performed a song in English with hand gestures in which the children delighted. Many of the boys wanted to wrestle Joshua. Some of the older children had, and wished for, the opportunity for a bit of English language study with the college kids. Many of the kids joined hands with us just to whirl around in a circle, like dancing without music. They all wanted attention of some sort: a smile, a hug, to be spoken with, looked in the eyes. I took photos which many of the children delighted in since they could see themselves right away. One boy wanted to take a photo himself with the camera and when I refused he himself refused to be photographed. There were several young girls, one who had a treated dog bite on her leg. One boy, who looked like a young Christopher Walken, seemed mild and sweet in the midst of the posturing. He had tears in his eyes when we left, and hugged one of the young men as if his heart would break. One young imp had problems with his eyes or vision and seemed to be not so smart. But how much of that was an act? He was a sly thing. He saw we also had brought snacks –which were not utilized since they had plenty–and kept trying to access them. When thwarted, he lashed out with kicks and hits. At the end, one young woman said to him, “let’s go!”. He joined hand with her and had a tantrum, then a sort of fit, when he was not allowed to come with us. Many of the kids understood more than a little English. Which makes me wonder if English-speaking tourists are a source of food during the warm parts of the year. The children also knew about praying and said ‘code words’ to indicate they understood how the game was played in some circles: “hallelujah!”, “amen”, “praise the Lord!”, with their sideways smiles, knowing looks, and hands held together in ‘prayer’. 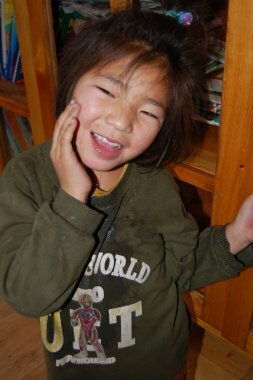 A good short film about where Mongolian street children live in the winter. The morning I took photos of Kirsty and the milk lady she did not have change for Kirsty’s money so we went with her to her ger down the street. She invited us in. The large hashaa contained 4 gers and one smallish brick building. The gers were widely spaced with grass (long, brown, dead) growing between. A small wooden entryway, then a lower entry into the ger. Round, hot, subdued light. A man smoking, a small boy –head shaved but for a small braid low in back–, an older woman, a middle-aged woman, and our lady who is in her 20’s and wears a wedding ring. The boy, we think, is hers. The man, her husband. The floor had blue and white patterned linoleum–the same pretty design as Hannah and Ganbaat have–and one large rug in front of a large bed. The bed was on the far wall directly opposite the entry. Just beyond the bed going clockwise, a stand with a TV, an open space, a small freezer, a white clean kitchen dresser with narrow counter on which is an orange thermos of weak slightly salty tea which we are served in bowls. The doorway, another piece of furniture, a printed with green-blue graphic zipped shut closet (? ), some clothes hanging, the rug-covered settee where we are invited to sit, a dark wood china cabinet with radio/cassette/CD player on top, and you are back to the bed. Large gold and red rugs on the walls. A small stove (like Hannah’s) in the middle. A small skylight that gave a good amount of light–a surprising amount. Red, blue, yellow painted poles, and milky orange-red staves holding up the roof. A small low square stool holding a box of 5-6 inch round cooky-ish items in front of our settee. Colorful and delightful visit. Kirsty thinks we were invited because she told the milk lady I am her mother’s friend visiting from America. Kirsty and I went twice to a shower house. 1500T for an hour of hot water cascading down. What luxury here. The hot water, that is, not the room in which one showers. I felt a large round something on my shoulder that I pulled off; the water washed it quickly away but not before it hit home that it was a tick. Obviously hitchhiked from home. Yana! Washed socks and undies as well as hair and me. It is so arid –20% humidity according to a little device Dan has–that the clothes hung out on the balcony were dry within less than a day. Getting water with Joel and John. They go more than a half mile at least once a week with a 60 L container on the water cart to get drinking water. We went over rocky, icy dirt roads and alleys. Shanty town. Ger district. 1L/10 tugriks. They go several times each week to get cooking/wash water. 70+L/time. Though today we got twice that amount. Some for Hannah and her family. A nice Mongolian man helped Joel and me as we struggled with the cart up hill by helping us push. The cart had a flat tire. The wash water water house is only a couple hundred yards away from the home. The boys wished to hurry so we could play Settlers of Catan. Joel went quickly to get dog meat. 2kg/500T for one days’ food. Dogs not usually fed water. There are dogs everywhere in the ger districts and the streets leading into them. Puppies also. Live and dead. Hooda and Rosie came with the house and like other dogs in other hashaas are kept to keep strangers out. Especially drunks. Alcoholism is rampant here. One main reason of insomnia are the constant barking of dogs. I shall mention here my embarrassing lack of skill sexing dogs. Kiny brought home a small puppy on my say that it was male. It was female. It seems I have never been around female dogs and they are built somewhat differently than large domestic mammals with which I am more familiar. Yana! Seeing Kiny and Hannah each morning brings tears. Overcast. The weather this morning said “the sky will fall today”. It began a light misty snowfall. Kiny took me on the trolley downtown. There are about 1300 tugriks/dollar. The trolley costs 200T per ride and buses are 300T. A large man got on and sat down in front of us. He cast nasty looks and said something in a vaguely threatening tone towards us as we spoke. We finally stopped speaking English and just sat. There are Mongolian Nationalists who do not like people from other countries to be here. He eventually changed the objects of his ire to a group of loud, silly schoolgirls at the back of the trolley. She took me to Mary and Martha to look at the crafts they have there. Eventually I returned and bought folded paper gers made by prisoners, a calendar of Mongolian landscape photos, felt slippers made by a woman’s cooperative, a purse made with a piece of Khazakh embroidery and some silver earrings each with a deel (say ‘dell’) button on the end and the wire twisted into a typical Mongolian diamond pattern. We went into several touristy souvenir places and cashmere shops. Cashmere yarn and raw fiber was not to be seen, only finished high priced goods. We went to the post office, right across the street from Sukhbaatar Square. I bought quite a few postcards. 350T each. 5 L milk bought this morning, 7 L two days prior. 900 tugriks/liter. The cow milk is strained and boiled before use. Am having Kirsty’s marvelous bread — crusty long loaves with the jam made with something like wild huckleberries. And Roma and milk. Kirsty makes and bakes most of the bread for two households, does dirty baby diapers and clothes for Peter, runs errands to buy food and pharmaceuticals, bakes special things (3 pineapple upside down cakes for a birthday and Peter’s 1 month coming out of quarantine celebration), and does school. Oh, and made a 4’x4′ quilt top which is being prepared to be quilted and bound. By hand. Had homemade salt pickles last night with Edam-style cheese and bread. And Roma and milk. To church at Mongolian Int’l University 3PM with Joshua and Daniel: Korean-run service. Loud contemporary music. Several songs BG uses. Sermon on anger–I kept nodding off. I had to stand up front with about 7 others to be introduced. The the whole congregation got up and processed by, shaking the hand of each of us. They sang a ‘blessing song’ to us. Offerings brought up individually and put in a box in front. Full meal–raw vegetables, sandwiches, juices offered afterward. But I was full–rice with chicken and veg topping for lunch. Visited Hannah and stayed too late. I waiting for Ganbaat, he waiting (I think) for me to leave and fixing the fence hole made by the neighbors in the hashaa next door. The hashaa is the enclosure one puts around the land one claims. Land is up for grabs. The hashaa formalizes your ownership. So ger districts have kept expanding. There are houses as far as one can see to the hill tops in three directions. The river and low land bounds the fourth. In the airport. The city itself is quite a ways away. The tall buildings of Beijing went on for miles. The sun is shining. It is 4PM. You are all asleep since it is 4AM at home. Free luggage carts. Music piped in–calm, sedate, not overly orchestrated but simple, relatively well done arrangements of European and Oriental folk tunes, Christmas songs and western classics like Beethoven’s ‘Fur Elise’. No constant annoying announcements. I like that the TV’s are turned down so low you must sit right in front of them to hear what they are projecting. Very good signage all in English and Chinese. The Departure board lists flights and rotates destinations between languages. Elegant. Spare. Beautiful. No US airport I have been in could be described thus. Young women work here. Everywhere. There are virtually no male faces or voices to help. There was one male overseer at both customs coming in and security as I left. At info and airline counters, stores and restaurants, luggage cart attendants, janitors, police and immigration staff, the voice on the train between stations–all women, all well-dressed and groomed. Their uniforms and grooming vary from simple (janitors, cart collectors) to rigid office formal (counter and staff interacting to help travellers) to very ornate (the uniforms of the women at customs and immigration, the fancy dresses and outfits found in store staff). It is disconcerting, thought-provoking to see the faces of the women, especially the service staff and police. Perhaps they are unaware of the raw, mute wistful wishfulness on their faces when they regard some westerners. Covetousness is not it exactly. It is more a weighing (but not just) of mutual material differences and of opportunities. Young girls as immigration police and aides — in uniform, speaking English. What kinds of homes do they return to at night? The janitors are the oldest women. Did I mention how spotlessly clean the airport is? Women scraping grime from the edge of yellow lines on the floor, cleaning tiles and grout in the bathroom, using large bamboo tongs to sort trash, washing windows as children put handprints on them. Saw one small boy in cutaway pants sans diapers. Spent 90 minutes speaking with Tony, a research scientist based in Hong Kong who would not tell me which proteins he is working to purify to use in medicine, who had lived in N. Jersey and is a US resident, whose children are attending Ivy league schools, who owns rental properties in LA, and who was interested in discussing the US economy, agricultural lifestyles, and the evils of the change towards materialism in Chinese life. He went silent each time I tied spirituality to materialism. He did not want to discuss that. He bought me a small cup of green tea Haagan-Daz ice cream and quizzed me thoroughly on land values, rents, and taxes. At MIAT (Mongolian International airline) check-in there were several large boisterous lamas in bright orange robes with an astonishing amount of baggage and boxes pushing to be near the front. Expecting deference. And getting it. Had to show my passport 4 times to get to the boarding area for UB. Was wanded. Everyone was. Lots of very young security people. Not a gun in sight.